1. Peel and devein prawns keeping the tail intact. 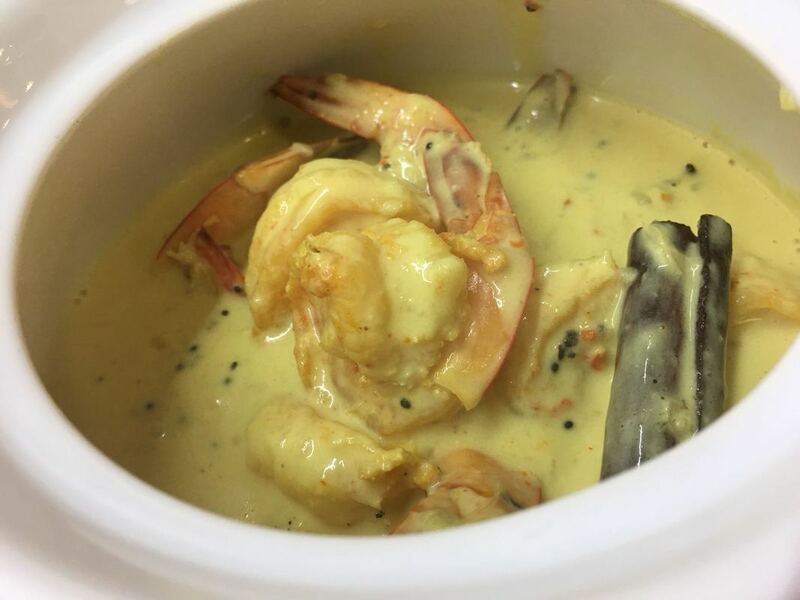 Sprinkle prawns with 1/2 teaspoon turmeric, 1/2 teaspoon chili powder and 1/2 teaspoon salt and set aside while preparing the sauce. 2. Heat oil in large wok. Stir-fry prawns on medium-high flame for 1-2 minutes until slightly golden brown. Set them aside. 3. In the same oil, add chopped garlic. Once aromatic, remove garlic and discard. 4. Coarsely pound cardamoms with a mortar and pestle and add them to the hot oil along with bay leaves, cloves and cinnamon. Next add onion paste and sugar. 5. Fry onion until it turns brown or until oil separates from the paste. Add grated ginger and continue cooking for another minute. 6. Stir and add coconut milk along with 1 cup of water. Add 1/4 teaspoon turmeric, 1/4 teaspoon chili powder, 1.5 teaspoons salt followed by green chillies. Mix well and bring to a boil. Reduce heat, cover and let it simmer in low heat for about 30 minutes. 7. When oil surfaces on the sauce add the fried prawns. Cook for a few more minutes for flavors to mingle. Serve hot with steamed rice or Rotis.